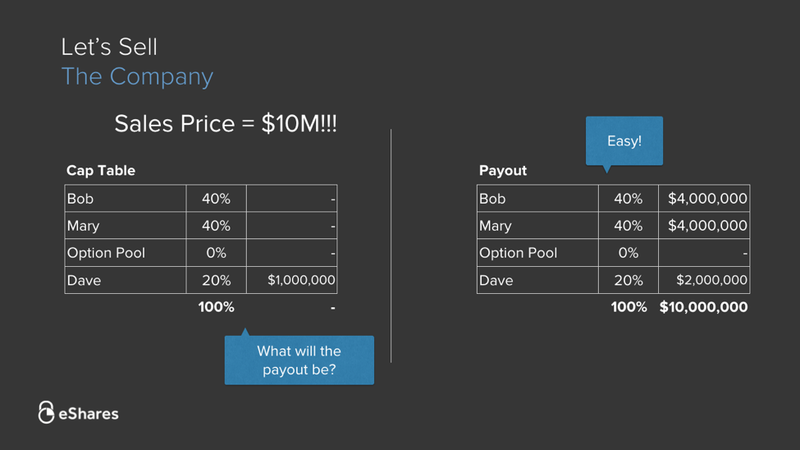 We give a presentation to all employees at Carta called “The life of a cap table.” In it we cover the basics of a simple financing, selling a company, and how both scenarios affect a cap table. We hope it is helpful to other employees and founders. A capitalization table (cap table) tracks the ownership percentages of a company. It is the record of truth for all equity transactions: employee stock options, preferred shares, and other securities. 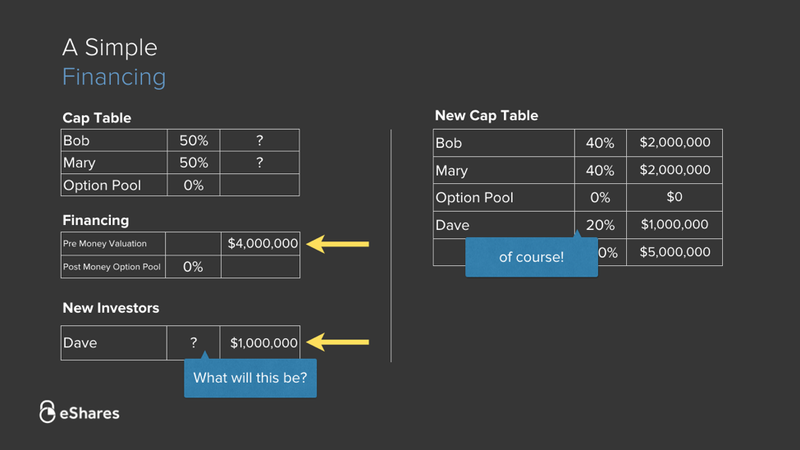 To explain some common cap table and liquidity questions, we’ll be using Bob and Mary as our example. Bob and Mary decide to start a coffee shop and they each own 50%. At this point the cap table is easy to track, because Bob and Mary have not raised outside money and they have no employees. But soon Bob and Mary decide to take investments in order to grow the company. Dave, an outside investor, agrees to invest $1,000,000 dollars at a “pre-money valuation” of $4,000,000. 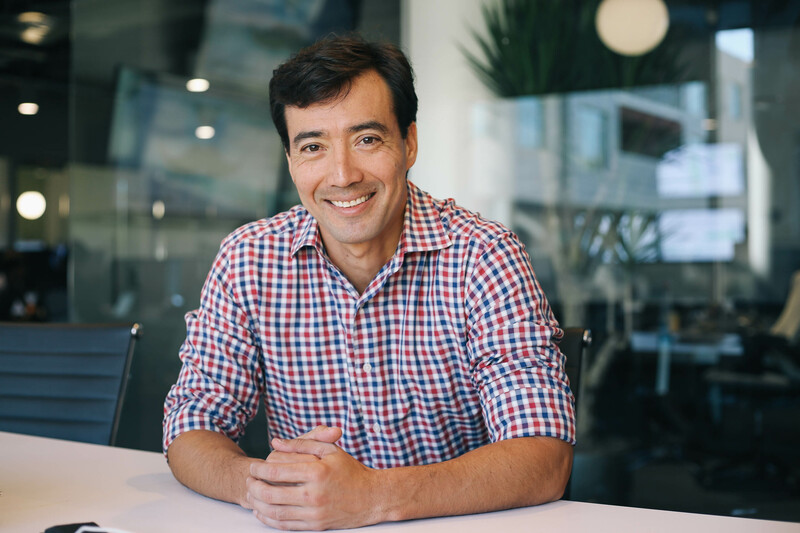 The “pre-money valuation” is negotiated between the company and investors, based on how much they think the company is worth today. This is usually the most negotiated term in a financing, because it determines what percentage of the company the investors own. Question 1: Based on Dave’s $1,000,000 dollar investment at a pre-money valuation of $4,000,000, what percentage will Dave own after the financing? Answer 1: Dave will own 20% ($1,000,000 / $5,000,000) after the financing. A common incorrect answer is 25% ($1,000,000 / $4,000,000), which uses the pre-money valuation to calculate Dave’s post-money ownership percentage. 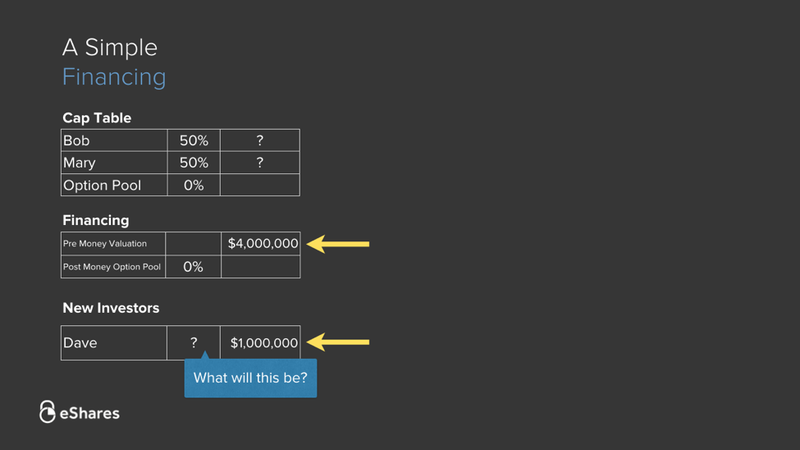 The correct answer uses the post-money valuation of $5,000,000 ($4,000,000 + $1,000,000). Now let’s take a look at the same simple financing, but this time with an option pool. 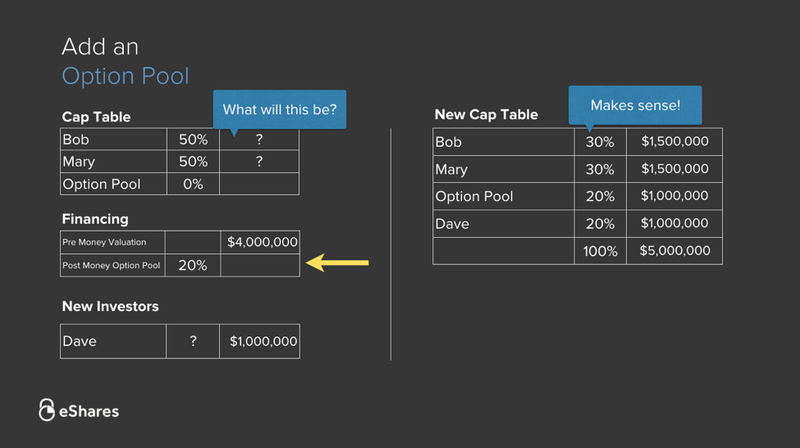 Bob and Mary did not have an option pool before the financing, but they decide to create a post-money option pool of 20%. An option pool is a portion of equity set aside for future employees. 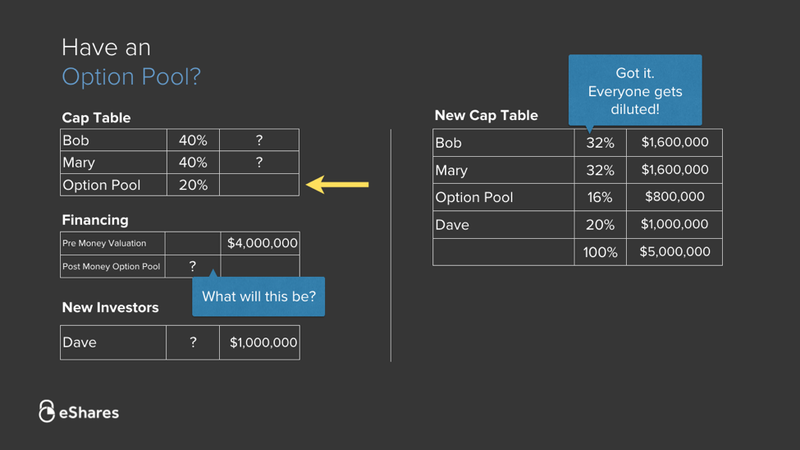 The option pool is created in advance so that existing investors don’t get diluted with each new hire. Question 2: How will the option pool affect Bob and Mary’s post-money ownership? Answer 2: Bob and Mary are diluted by Dave’s investment. 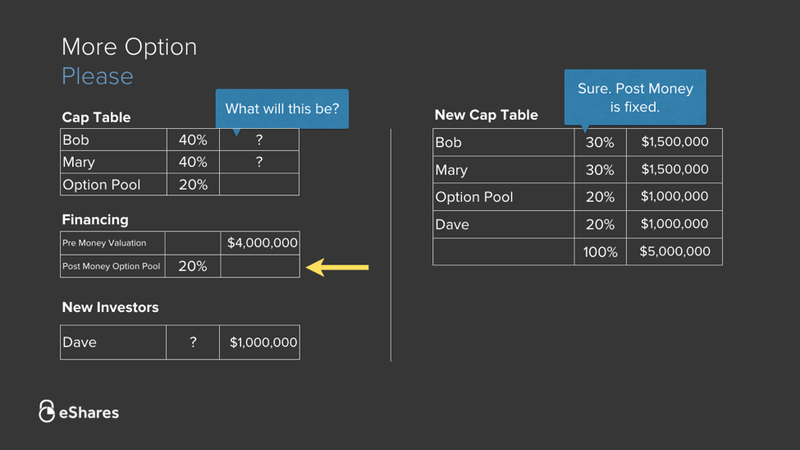 Because they negotiated a 20% post-money option pool, Dave’s 20% has to come from Bob and Mary. In our third example, Bob and Mary have an option pool before the financing, but no post-money option pool is negotiated. This time everyone gets diluted, including the option pool. 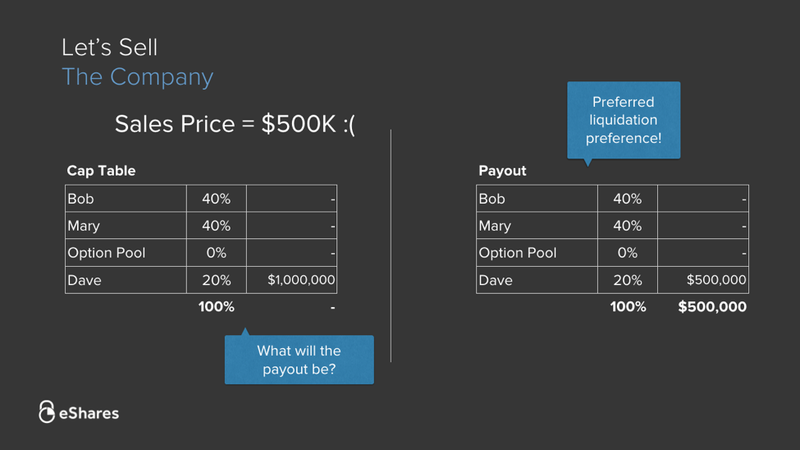 Because the post-money option pool was not negotiated during the financing, Dave’s 20% comes from Bob, Mary, and the option pool. This is what it should look like when an existing option pool is refreshed during the financing. Now that we’ve learned the basics of financings, let’s talk about liquidation. The 2 most common liquidation events are IPOs and acquisitions. For simplicity we’ll be looking at an acquisition scenario. Question 3: If Bob and Mary decide to sell the company for $10M, what will their payout be? Answer 3: In this case the payout is easy. Just multiply each person’s ownership percentage by the sales price of $10M. For example, Bob owns 40%, so $10M x 40% = $4,000,000. Now let’s imagine the coffee shop isn’t doing so well. Bob and Mary decide to sell the company for just $500,000. Question 4: What will the payout be in this scenario? Answer 4: Dave is the only shareholder who get’s paid out. This is called a “liquidation preference”. 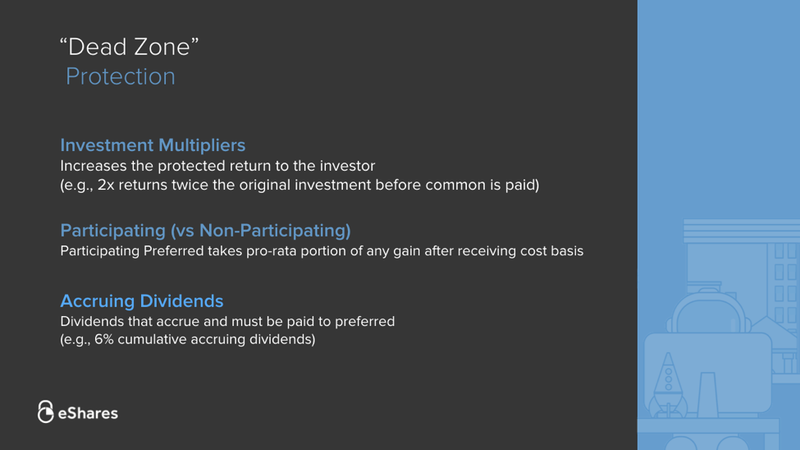 A liquidation preference means that investors (who own preferred stock) get paid out before everyone else (who own common stock), until the entire investment is paid off. It’s important to note that there are two types of stock: Common and Preferred. Outside investors typically get Preferred stock, where founders and employees get Common stock. Preferred stock gives outside investors additional protection for their investment. For example, if the company sells for $999,999, Dave will still get all $999,999. Bob and Mary will only start getting paid out once the sale price exceeds Dave’s $1,000,000 investment. To better understand Preferred stock and the additional protection that comes with it, we can look at two fundamental rules. 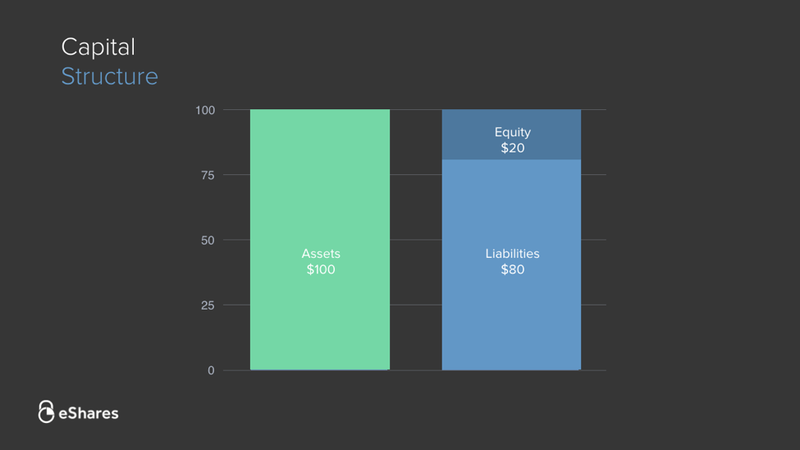 The first Accounting rule states that Assets = Liabilities + Equity. For our purposes, Assets means the sales price of the company, Liabilities means debt (Dave’s outside investment), and Equity means shareholders (Bob and Mary). The second Liquidation/Bankruptcy rule just means that in a liquidation event, debt (Dave’s outside investment) gets paid before equity (Bob and Mary). 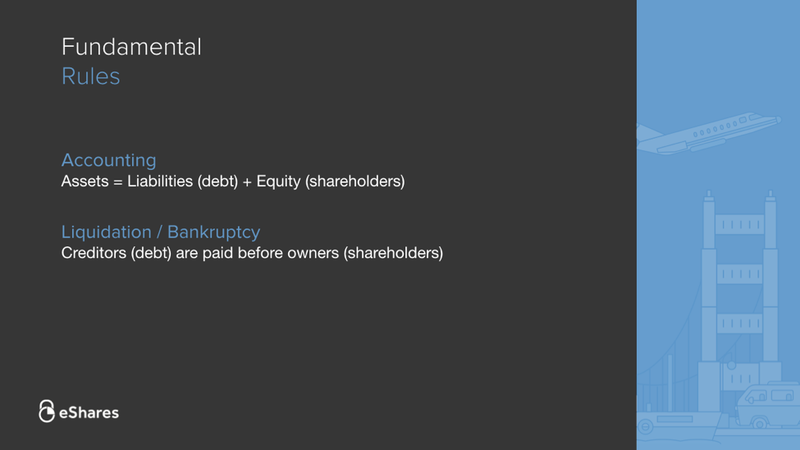 This capital structure chart shows a company that sold for $100 (Assets). The company also took $80 of outside investment (Liabilities), and the payout leaves $20 for remaining shareholders (Equity). But what if the company only sells for $80? In this case the shareholders lose everything, because it takes all $80 to pay off the outside investment (Liabilities). 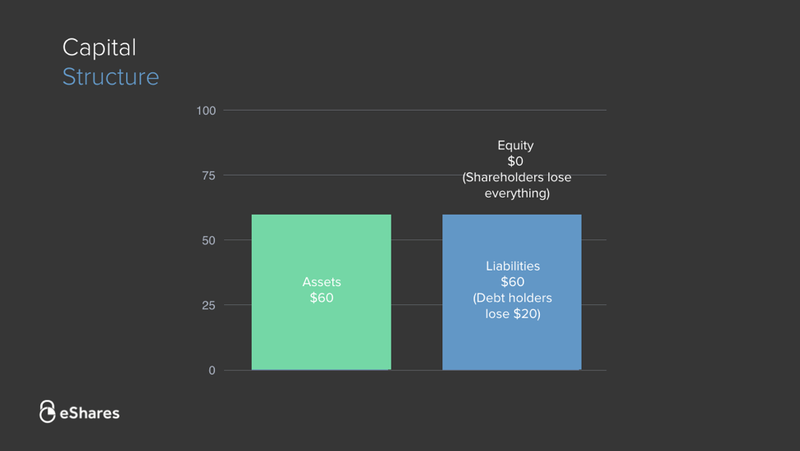 After the debts is paid off, there is nothing left for shareholders (Equity), so they lose everything. 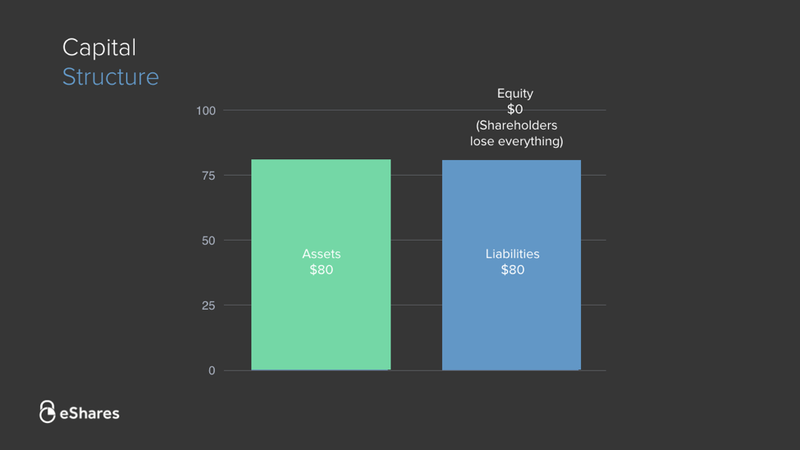 This time shareholders (Equity) lose everything, and outside investors (Liabilities) lose $20 of their initial $80 investment. We can also visualize these payout scenarios in a graph. The x-axis shows various sales prices (Assets), and the y-axis shows the investor (Liabilities) and shareholder (Equity) payouts as a function of sales price. Equity holders get nothing until Debt holders have been fully paid off. 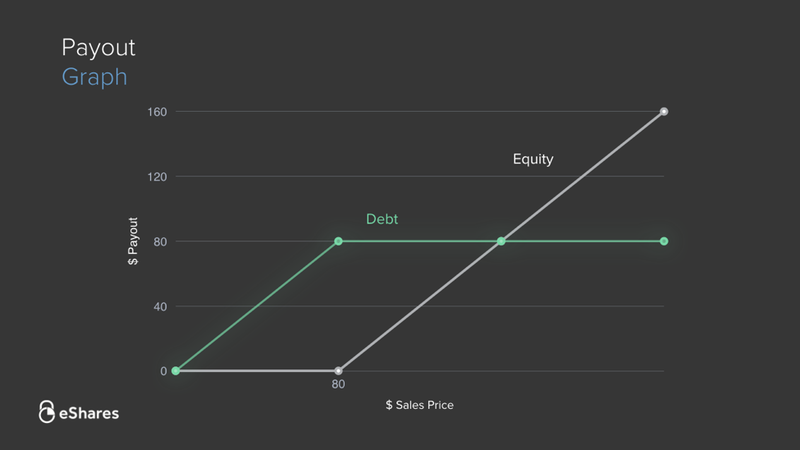 That is why the gray line is at $0 until the sales price reaches $80 (the amount of the initial debt investment). Once the sales price exceeds $80, the payout shifts from Debt holders to Equity holders. Now that we’ve talked about financings and liquidation, let’s see how investors negotiate downside protection. In Bob and Mary’s case, Dave invested $1,000,000 in Preferred stock. 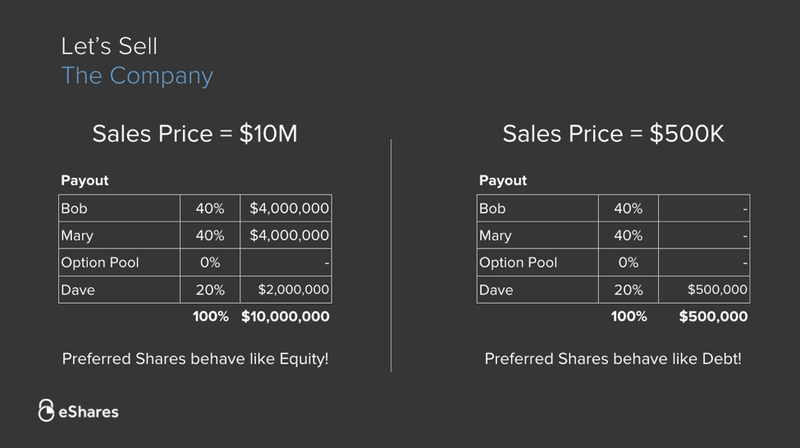 As a result of his liquidation preference, for any sales price below $1,000,000 Dave’s shares behave like debt, and for any sales price above $1,000,000 they behave like equity. Below is the payout graph for Bob and Mary’s company. Again, their payout (green) stays at $0 until Dave’s $1M investment is fully paid off. For sales prices between $1M and $5m (the “Dead Zone”), every dollar of payout goes to Bob and Mary. Once the sales price exceeds $5M, Dave participates in the payout again. This is because the initial negotiated value of the company ($5M) has been realized. The area on the graph between $1M and $5M is called the “Dead Zone.” During a financing, this is where investors often negotiate to protect themselves. If the company sells for a price in the Dead Zone, investors want to maximize their payout. In this section we’ll cover three ways investors negotiate for “Dead Zone” protection. 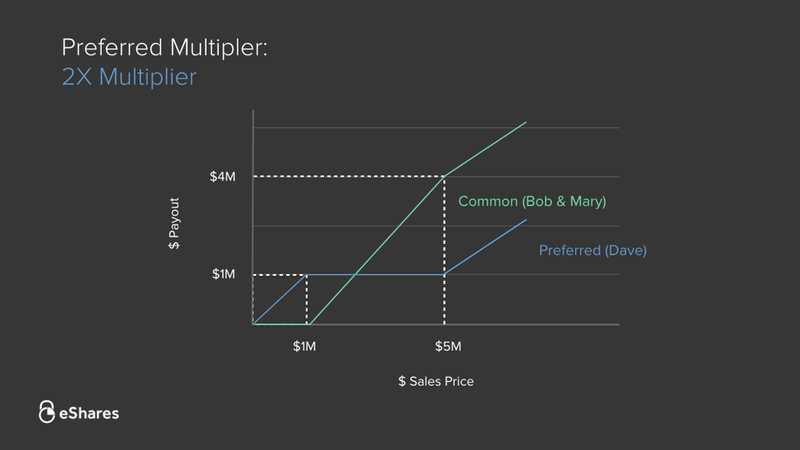 Let’s go back to the original payout graph for Bob and Mary to see an example of the first protection method: Investment Multipliers. A 2x multiplier means Dave gets paid out twice his investment before equity holders get paid anything. This is highlighted by the yellow dotted line in the graph above. 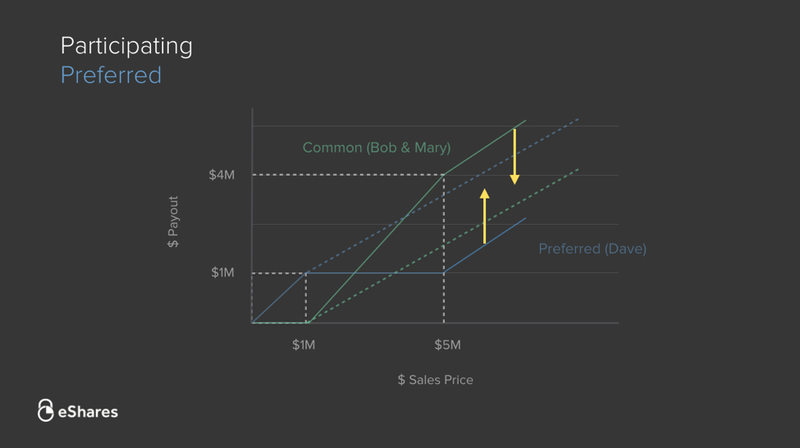 Again, we’ll go back to the original payout graph for Bob and Mary to see an example of the second protection method: Participating Preferred. 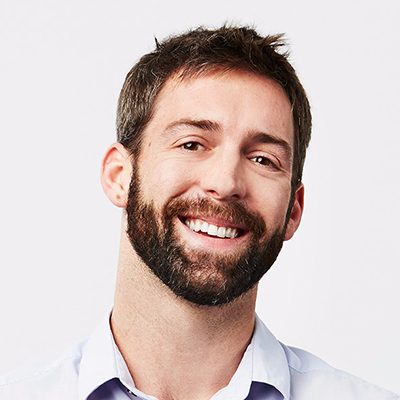 With Participating Preferred shares, Dave participates like an equity holder immediately after receiving his investment back. As you can see, Dave’s payout increases even when the payout is in the dead zone. He does not have to wait for a sales price larger than $5M to participate. Lastly, we’ll go back to the original payout graph for Bob and Mary to see an example of the third protection method: Accruing Dividends. 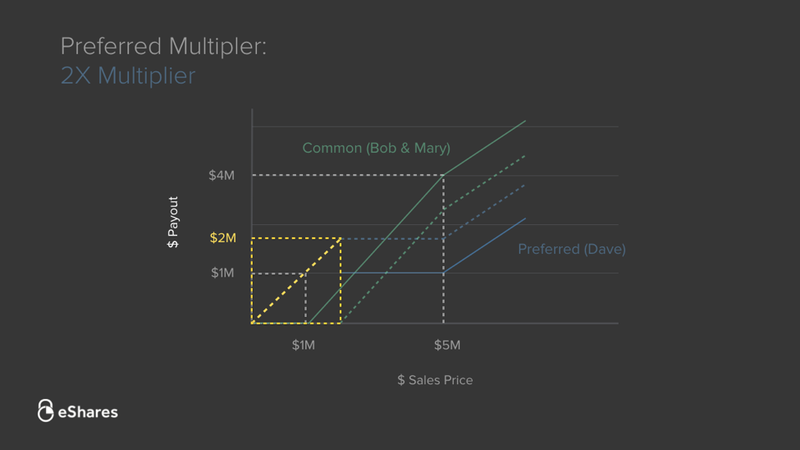 Similar to the Preferred Multiplier, Dave is paid out beyond his $1M investment. 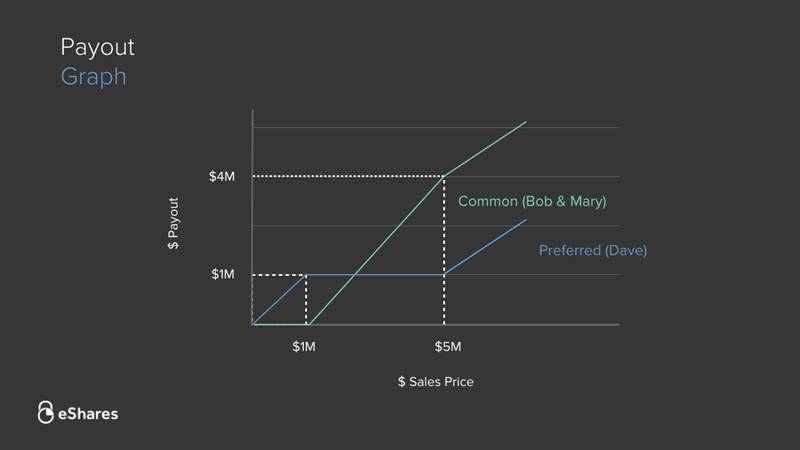 The difference is that Dividends do not impact the payout graph for Bob and Mary. It is an additional cash payout. First, we covered a simple financing and how it affects the cap table. The most negotiated term in a financing is the “pre-money valuation,” because it determines the investors’ ownership percentages. Second, we talked about selling the company. The important thing to remember is that for sales prices below the total outside investment, Preferred share behave like debt and are paid out before Common shareholders. Third, we covered 2 fundamental rules. In short, Liabilities (outside investors) are paid out before Equity (Common shareholders). Lastly, we talked about “Dead Zone” protection. This is how investors protect themselves at sales prices between their initial investment and the post-money valuation. 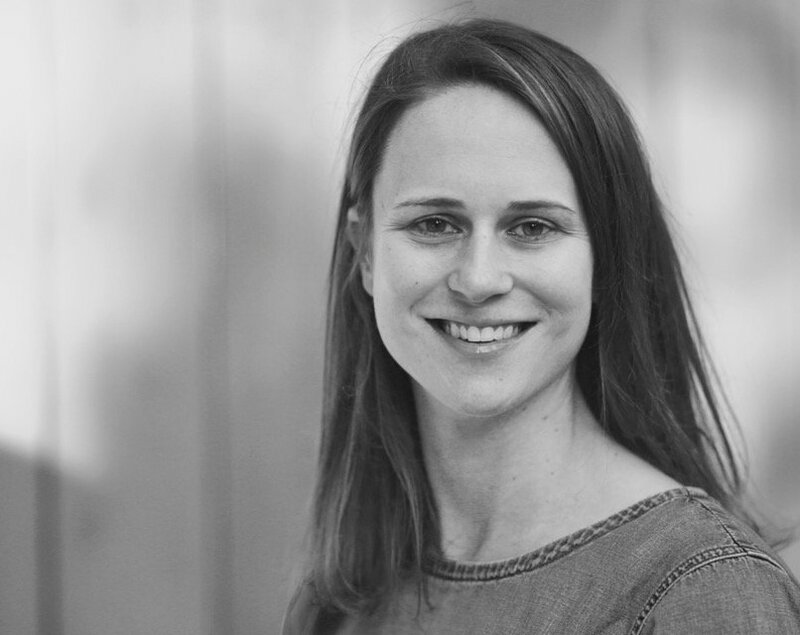 We hope this was a helpful introduction to financings, liquidation, and cap tables.